Movies.com > Movie News > Batman, Wonder Woman, Superman -- Is This Our First Look at Zack Snyder's 'Batman vs. Superman'? 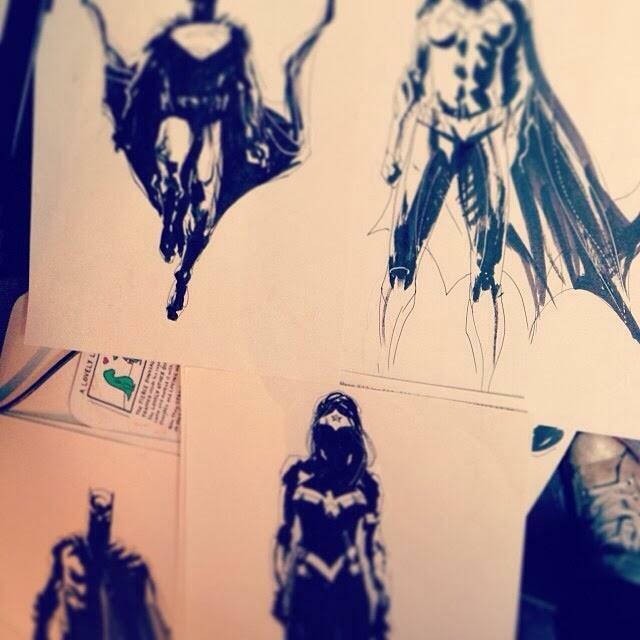 Batman, Wonder Woman, Superman -- Is This Our First Look at Zack Snyder's 'Batman vs. Superman'? "So it's an hour long, it's free, it's on the Internet, but it's just kind of to be like 'Hey, Man of Steel is coming out!' But there are two things: there might be announcements during this show and the one thing I do know is there's artwork going to be on this show that may or may not have something to do with a movie that's coming up." There may also be an announcement or two, perhaps regarding the rumors swirling that Wonder Woman will also be in the movie. Conveniently, the artist Jock also tweeted out some images yesterday and claimed they were for "some WB" project he's been working on. The artwork features Batman, Superman, Wonder Woman and Batgirl, and many are connecting the dots and realizing that this may indeed be a piece of the artwork that Zack Snyder intends to reveal during the fan event. Update: Jock has since come out and claimed the images are not for the movie, but of course he's going to do that. If this is artwork from the movie, it would confirm not only that Wonder Woman is a character, but also Batgirl. Recent rumors are connecting various actresses to the role of Wonder Woman, while others claim it's just the part of Bruce Wayne's girlfriend. Well, perhaps they're all wrong and the casting is instead for Batgirl. If both Wonder Woman and Batgirl were involved in this movie, it'd be a nice touch on the part of Warner Bros. to introduce two strong female superheroes right alongside two strong male superheroes. Based on this image, Wonder Woman looks sorta like a ninja, and all the costumes are pretty slick. Is Jock just messing with everyone or is this really our first look at the 2015 movie? Can DC steal some of Marvel's thunder after the latter absolutely dominated the week with tons of news? What do you think? In case you're curious, the fan event will be held here at 12 p.m. EST on Saturday, November 9.